As you travel away from London on the Thames, the river gets narrower, yes, but the boats also! The de rigueur boat on this stretch of the Thames ranges from ocean capable liveaboard yachts to more modest plastic cruisers. But the traditional narrowboat is a relative rarity. I suppose one reason for this is that the wider river gives more space for fellow boaters. Maybe another reason is that one can feel easier travelling faster even though the speed limit above Teddington Lock near London is 5 mph – that’s only 1 mph higher than the narrowest canal in the rest of the inland network. Another reason could be that this stretch is the weekend retreat of many of means, so why be cram the family into a narrowboat if the waterway is wide and you’re not going very far for very long – home comforts being the highest priority! The landscape also has a different scale. 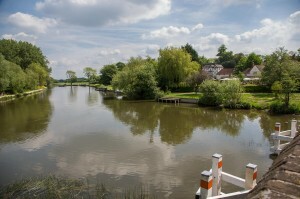 Wider views both of countryside and townscapes are the norm rather than the inherent restricted view of narrow canals. Both have their merit and beauty, the latter bringing one closer to nature, that is bugs, birds, fish and trees and bushes – and indeed more intimate with people on the towpath – a big plus for very many. This stretch of the river sees its width reduced from wide to moderate ie 8 to 4 on a scale of 1 to 10 ie single width narrow canal to tidal Thames east of London. So, Windsor is pretty wide and the route to Reading has its narrower moments (but not all the time) and the locks are large many taking 6 or more boats at a time. Having said all this, in absolute terms, this stretch is a picturesque blend of countryside and town and a must to visit whatever your taste in waterways is. My visit suggests that much use is made of the waterways with far more recreational and sporting use than with the narrow canals. Below are photos taken along the route. And, below that a Google Map showing the places in the photos. Click in the map below to display a list of locations marked.